Your generous donations and support help us continue our club's Freedom Canes Project, as well as providing funds for general club expenses. for our Freedom Canes Project. to provide funds for making these canes. Thanks! CCW President Walter J Imfeld III in middle. We are Chapter #23 of the California Carvers Guild, a statewide organization of woodcarvers. It has approximately 51 active chapters, organized into two districts, Southern and Northern. We are a part of the Northern District. As a non-profit organization, members of the Central California Woodcarvers are committed to sharing skills, interests, and knowledge. We strive at improving the skills of all the members. 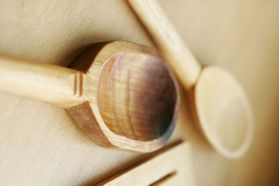 Our intent is that every member would thoroughly enjoy the hobby, and the art, of wood carving. Bringing out the best in each other is our goal. We want to thank you for visiting our website. And ask that after you look us over you consider joining us to start being a woodcarver, or to become a better one.